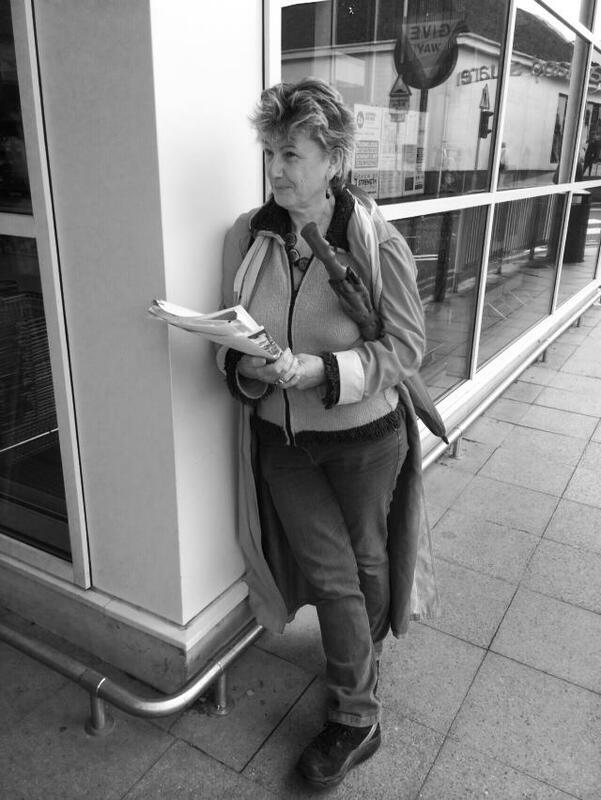 Street writing – coming out of the creative writing wilderness | Don't mention the M word! 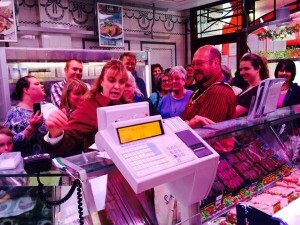 Lynda Rooke peforming in the Butchers, Crewkerne. It’s been more than 20 years since I last produced any form of creative writing. Life takes us down different paths to what we envisage for ourselves; our talents, our creativity, often lend themselves to other areas of our lives and manifest in the things we do. I had mixed feelings when I learnt as an adult that I was dyslexic. In some ways it was a positive revelation. It explained why I had had difficulty with grasping words to express myself in the written form. Knowing did enable me to create strategies to overcome what I found difficult to do. Being dyslexic doesn’t mean you can’t achieve a good command of written expression, you just need to find work-arounds to solve the problems you encounter along the way. Still, the not-so-positive feelings about being dyslexic also sit with me. One comes across people who don’t believe it’s real, believing perhaps it’s just an excuse for not being very good at spelling or having poor handwriting. You also can, at times, feel quite anxious about letting people know. It may be wrong to have such feelings, but I do find admitting I am dyslexic rather embarrassing . When I didn’t know I was dyslexic I simply didn’t put pen to paper. I didn’t think I could, even though at school and college I wrote reams of plays and monologues and teachers would single me out as the one who would pursue her talents. But what stopped me? It takes an enormous amount of effort to pin down the words. This in turn affects your belief in your ability to write. Staring at an empty page was (and still is) just the worst thing to do. You think it can’t be possible for words to ever flow. You are as blank as the page itself. Signing up for Show of Strength’s “Trading Places” creative writing workshops was a big deal me after a long period being in a creative writing wilderness. SoS is the creative vehicle for writer/producer Sheila Hannon to drive accessible art whether people will take it. I first came across Sheila in a pub in Bedminster. Trading Places are short monologues performed in the high street – Alan Bennett Talking Heads, but not stuck in an arm chair. A different kind of retail therapy that brings people into shops to watch characters burst into life amongst the groceries, clothes on the peg or the sputtering sounds of a coffee machine in a cafe. Some people are just in the shop anyway, others follow the trail of theatre up and down the high street. Show of Strength work with local writers, often new writers who can draw in truly local stories to tell via their characters. 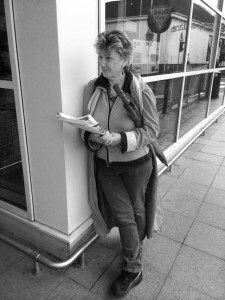 Sheila works with professional actors which helps to create a theatrical magic in the unlikeliest of places. The shops themselves recognise at the base level Sheila is returning people into shops to not just dive in and out following a quick purchase, to stay a while to contemplate and meet other people. I believe shop spaces have to think differently in a digital age, differentiate themselves to the online purchase environment, more on that subject in a previous blog. Working with Wells Literature Festival, Show of Strengths is producing 12 monologues in shops in March 2015. In November there are a number of workshops to find local writers to develop the scripts. I attended the first of these workshops. “The rule is there are no rules” – Sheila Hannon driving her accessible art whether people will take it. The workshop was an informal gathering where Sheila explained the concept of Trading Places, with the help of one of her actors (Will Bateman), who read out a monologue performed in Crewkerne when the Trading Places bus camped up to perform there recently. “The rule is there are no rules,” Sheila told us. The monologue should be around five minutes and 750 to 1000 words. Our starting point is to create a character and, instead of writing a short story, we should produce a series of thoughts (from our character) that draw in the audience and allow them to feel part of the story. Our character doesn’t have to be a person, Sheila told us. One monologue for Trading Places had a character who was in fact a table. This got me thinking. My starting point, or character is, a Teddy Bear. Yes, a Teddy Bear in a toy shop that nobody buys. Let’s see where this takes me. Go to it, Claire! Poor lil’ Teddy. Can’t wait to read it. All the best, John H.
Thank you Claire for coming out on being a dyslexic. My wife was bullied in school by the teachers for being a poor writer and had a nervous breakdown. Good luck with your story.